I spent this weekend at the RIAT 2018 Airshow. It was loud, spectacular and made all the more special because I was joined by number 1 daughter. My personal favourites, the RAF Red Arrows, turned up early in the programme and delivered a flawless acrobatic display against clear blue skies. As their display ended, I remember thinking – I feel sorry for the people who have to try to follow that! And that was the problem, some display teams from other countries tried – and it just didn’t work. The next couple of displays were from solo fast jets who clearly enjoyed being very loud and making small children cry and their parents grin. But there were several acrobatic display teams who came on over the rest of the day who clearly were copying or modelling themselves on the Red Arrows, even down to using the same names for certain aspects of their display. Their pilots were clearly skilled, their commentators were enthusiastic but they were not the Red Arrows – and they looked like they were trying to be. It was a bit like drinking a glass of Pepsi on a hot day and then following it with a glass of supermarket own brand cola. The same, but not quite touching the spot. 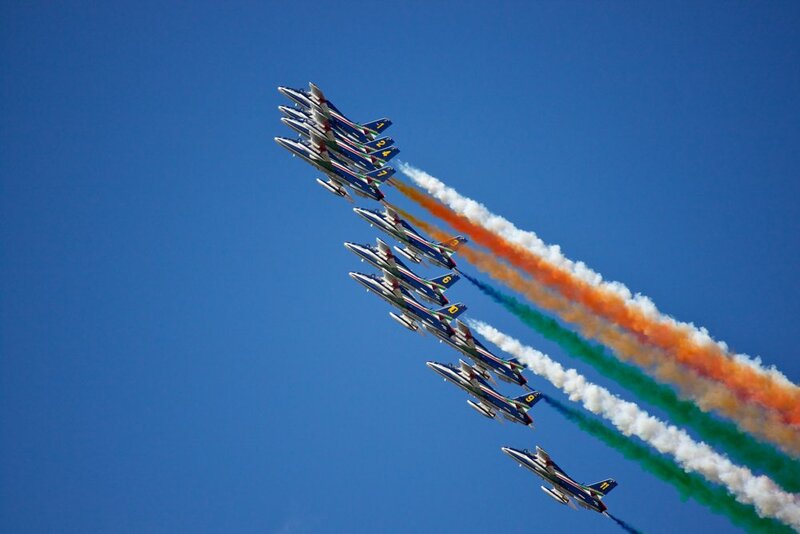 And then, the last big display of the day was from the Italian display team the Frecce Tricalore. Their display was bright and bold- their commentator had the crowd grinning with his infectious enthusiasm – and they were doing their own thing, their own way. They were not trying to copy anyone, they were being themselves. There is a lesson here for us all: you need to be your own kind of awesome. Those display teams that tried to copy the Red Arrows but ultimately missed the mark did not understand this in the way the colourful Italian team did. The Frecce Tricalore delivered a barnstorming show that had the crowd cheering and they did it their own way, and were not copying anyone else. The Frecce Tricalore brought their own kind of awesome to their display. Even though all these different display teams were doing fundamentally the same thing – flying acrobatics in aeroplanes – the two stand out displays were from the two teams that did their own thing – the Red Arrows and the Frecce Tricalore. The teams that were less impressive were all trying to be someone else. How often do we try to copy someone else’s approach only to find it doesn’t work for us? We see businesses copy each other, film makers, pop stars – even in our offices. Have you ever tried to get ahead by copying someone else’s behaviour or attitude only to find it backfires? We need to bring our own kind of awesome, not copy someone else’s. There are two different kinds of confidence: regular confidence and Courageous Confidence. Regular confidence (or just confidence) comes when we trust in something else or someone else. I stand at the bus stop because I have confidence that a bus will eventually turn up. I take a paracetamol because I have confidence it will ease my headache. I take the advice of my mentors because I have confidence in their wisdom and abilities. Courageous confidence is different. Courageous confidence comes when we trust in ourselves – that’s where the courage comes in, because we are putting our own abilities on the line and not trusting in someone else. The Red Arrows and the Frecce Tricalore have Courageous Confidence – they do the same thing (flying planes) in their own unique way and deliver world class results. They each bring their own unique awesome. In your career, you are probably doing the same thing that many other people do in your company. Managing projects, writing code or closing sales. Your success will be hugely dependent on the level of confidence you bring to each day. You know the theory, you have read the books and been on the courses. If you trust in what you have learned – put your confidence in what you have learned – you will do well. But if you want to shift your performance from doing well to world class, then you need to shift your confidence from trusting in others to trusting in yourself and employ your own Courageous Confidence. Don’t try to copy someone else, learn from them – certainly – but do not try to be a carbon copy. Bring your own unique awesome every day. Find your own strengths and play to them. Have the courage to put your confidence in the unique mix of experience and talents that makes you uniquely you.